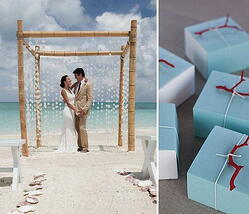 Caribbean destination weddings are popular for a lot of reasons. Many brides dream of getting married on the beach. And if you go through a Certified Destination Wedding planner like The Sand Lady, a destination wedding can be much less stressful and time consuming to plan than a local wedding. You will work with one wedding "vendor" - me - rather than several vendors for flowers, catering, etc. Sandals offers an array of colors from which to select your color palette. Your wedding can be as customized as you like. You can select from dozes of floral options, cake designs, ceremony and reception decor, entertainment and more to design the perfect celebration that reflects your personalities and style. 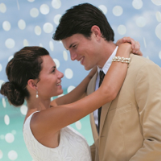 For brides that prefer a professionally designed theme, Sandals offers 5 gorgeous designer themes to choose from. More on ceremony and reception design options here. 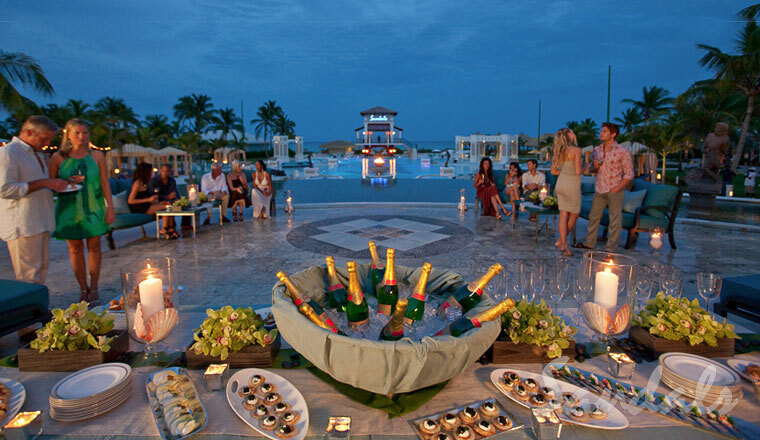 Sandals resorts is currently offering a $1,000 credit to give you more choice and flexibility when designing the perfect Caribbean destination wedding. This limited time promotion includes $500 wedding credit to use towards your customized destination wedding and $500 honeymoon credit to use on items to enhance your honeymoon such as renting a private beach cabana, a catamaran cruise, honeymoon highlights video, etc. For brides and grooms who want to celebrate with friends and family, Sandals offers lots of extra inclusions to enhance the group's time together and to reward the bride and groom for celebrating their marriage with Sandals. Wedding groups of 5 or more rooms may earn a special group cocktail hour with hors d'oeuvres and signature cocktail, private pre-wedding celebration dinner for the group, complimentary plated wedding reception, manicure and pedicure for the bride, massage for the groom, and more. Create a Gift Registry filled with memories to cherish for a lifetime. 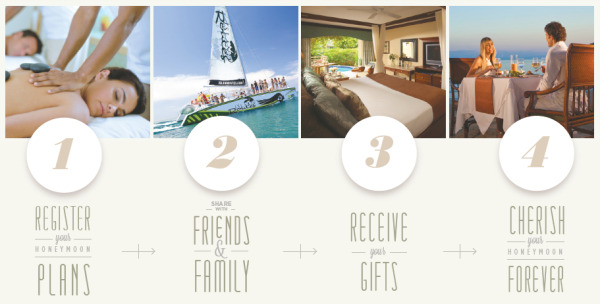 Your Sandals gift registry lets you create a wish list to make your destination wedding and honeymoon unforgettable. From a romantic couples massage by the sea, to an adventurous horseback ride on the beach, or an upgrade to a luxurious Love Nest Suite. 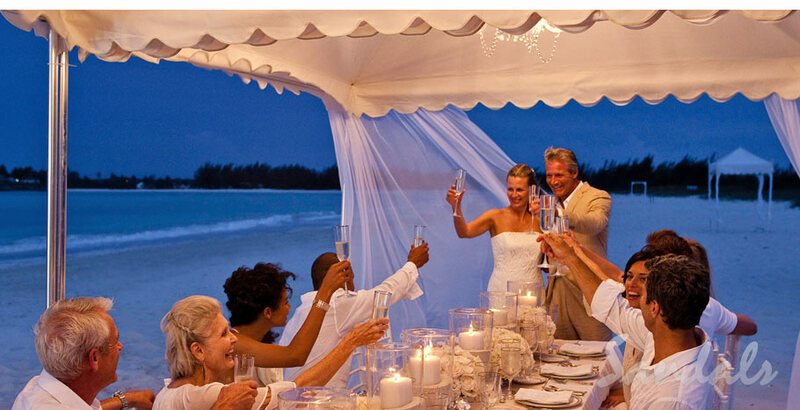 Read more about the destination weddings that we plan at Sandals resorts as well as real Sandals weddings here. Or click below to request your Complimentary Destination Wedding Consultation with The Sand Lady. There is never any fee for our service or obligation for the consultation. Let's get started planning your dream wedding! 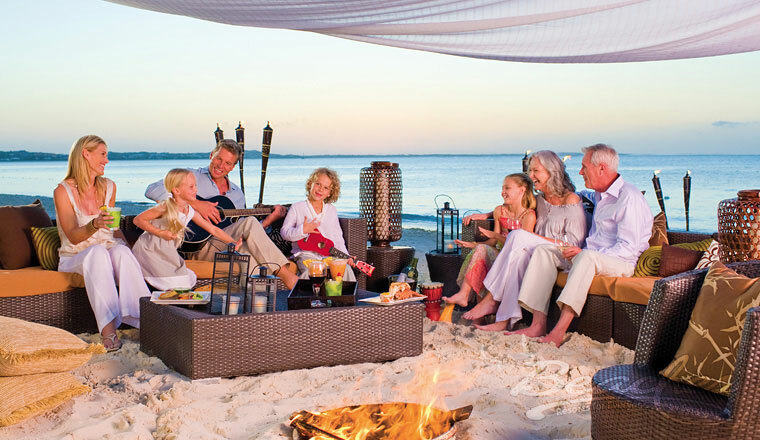 - Friends and Family that love the beach! ** Groups traveling during 2013 will receive a 6th room free. ** Groups traveling during 2014 and 2015 will receive a 7th room free. There are a few restrictions to this promotion. One room needs to be booked by May 30, 2013. Our agency specializes in group travel. We will work with you to plan your group's trip, ensure you receive special group amenities such as complimentary cocktail receptions, group dining and photo sessions. Then just tell your group members to contact us and we will arrange each individual's travel... and your room could be free! Gordon "Butch" Stewart, Chairman of Sandals Resorts International, invites Sandals Select Guests* to participate in The 6th Annual Chairman's Invitational Golf Tournament. The tournament will take place at the beautiful Par 71, 18-hole Sandals Golf & Country Club championship course in Ocho Rios, Jamaica September 13-15, 2012. Participants will be treated to lunch on the course, a VIP Welcome Home Cocktail Party, and a chance to hold the winner’s title! 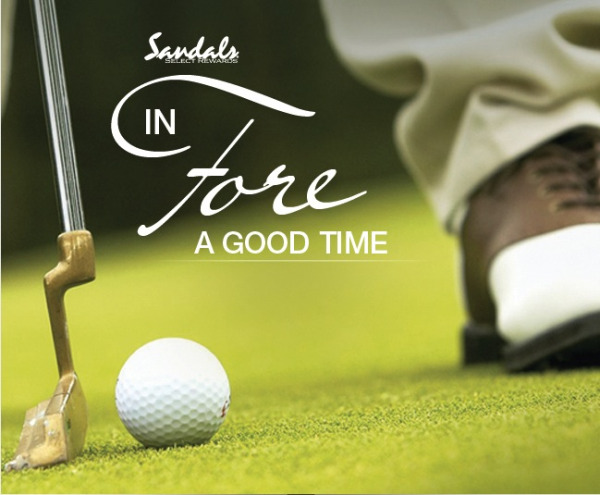 This exciting, 2-day golf tournament is designed exclusively for our valued Sandals Select Guests and is sure to please with plenty of surprises, giveaways and gifts, an Awards Ceremony Dinner, and more! A variety of golf prizes and much, much MORE! To book your stay at Sandals Grande Riviera, Sandals Royal Plantation or Beaches Boscobel and RSVP for the tournament, contact us today! *Previous guests of a Sandals or Beaches resort are eligible for the Sandals Select Guest program and this golf tournament. If you have stayed at Sandals or Beaches and you aren't sure if you have joined the program, just contact us and The Sandals Lady will take care of the details for you! It is time to share the big news... We've been planning a very special event for our East Tennessee friends! Please join us at 6:30pm on Thursday, January 19 at the historic Capitol Theatre in downtown Maryville for the biggest Caribbean night ever! We have partnered with some of our favorite event-planning professionals in the Knoxville area to bring you a break from the winter cold. Come escape with us for a night to island paradise! Relax and enjoy the music of Carib Sounds, Knoxville's only steel drum band. Taste the culinary art of Knoxville's premier caterer, All Occasion Catering. Have a drink and take in the beauty of of the historic Capitol Theatre. Visit with one of Maryville's favorite photographers Mobley's Photography and Knoxville's leading wedding planning resourse The Pink Bride. The Sandals Lady will treat you to a short presentation on the Sandals and Beaches resorts. Our co-sponsors will give away lots of door prizes. And then, one of our lucky travel friends will WIN a 3 night all inclusive Sandals vacation! If you don't win your 2012 vacation, by attending the Caribbean night, you will receive a $250 resort spa credit when you book a qualifying Sandals or Beaches vacation within 14 days of the event. Click Here to buy your $5.00 ticket. Beaches Turks and Caicos is rolling out the red carpet for you and your girlfriends to go on a 4-night best friends vacation in paradise at very special rates, filled with special activities and special goodies. 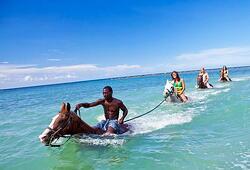 So, grab your girlfriends, kick back, relax and enjoy Caribbean-style fun at the Beaches Friends Forever (B.F.F.) Girls Getaway. Rates start at $1,299 per person plus airfare, based on two people in each room. This is a very special girls getaway, and space is limited! The April 2012 offer is filling up fast. Contact Us to let us know that you are interested!